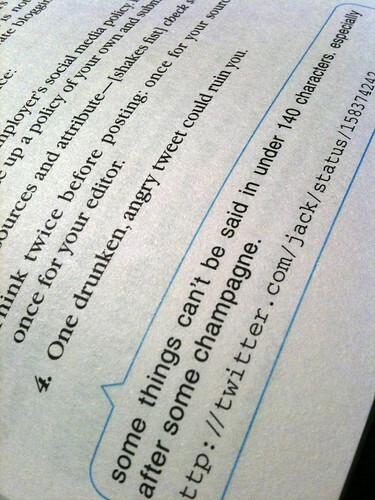 The following is an excerpt from 140 Characters, page 9. There’s the story you wanna tell, and the story a reporter wants to hear, and somewhere in between is the story that gets told. Real reporting can take place within social networks. There are two key principles to remember. First: Public Twitter and Facebook updates are a part of the permanent record, and all searchable content is fair game for journalists. Second: A direct relationship with your social sphere is fundamental; keep it independent of the media outlet that employs you. Keep your professional identity as a reporter independent and portable because jobs can come and go. You will want to retain your readers during times of change. Additional caveats apply to journalism. This list is not comprehensive, but is rooted in experience with corporate blogging and investigative reporting. Own your smartphone and a great set of mobile apps. Determine your employer’s social networking policy. If they don’t have one, write up a policy of your own and submit it. Check sources and attribute-[shakes fist] check sources! Think twice before posting: once for your source and once for your editor. One drunken, angry tweet could ruin you. some things can’t be said in under 140 characters. especially after some champagne. Jokes can almost always be taken the wrong way; expect this. Never discuss a story before its time, or tweet about something before it happens. Be as clear as possible with your sources about when you expect your story to post so they know when and how to promote it. Avoid writing about colleagues or the workplace. Follow other journalists: @jennydeluxe, @michaelbfarrell, @mat, and the rest. 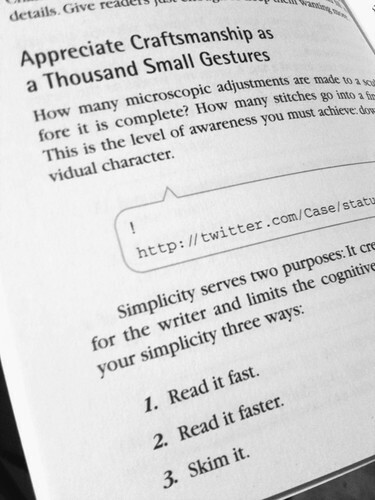 You think you want to be a Twitter journalist? You’ll need to check your facts, provide a truly unique perspective, and most of all lead with action. Do this with fairness, accuracy, and more than a single source, and you will always have a job. 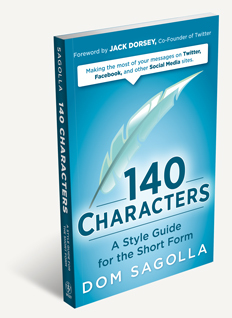 Excerpt from 140 Characters: A Style Guide for the Short Form, page 18. How many microscopic adjustments are made to a sculpture before it is complete? How many stitches go into a fine garment? This is the level of awareness you must achieve: down to the individual character. Judge your simplicity by skimming your words. Your readers will skim it. They will misunderstand it. They will even repost it, having skimmed it and misunderstood it. Expect this, plan for it, optimize for it. Get ready to say it once. Or, get ready to say it wrong, delete and repost really quickly. If you’re lucky, no one will notice your mistake except the search engine. Limit yourself even further than the constraint requires, and then having the extra freedom will seem like a luxury.